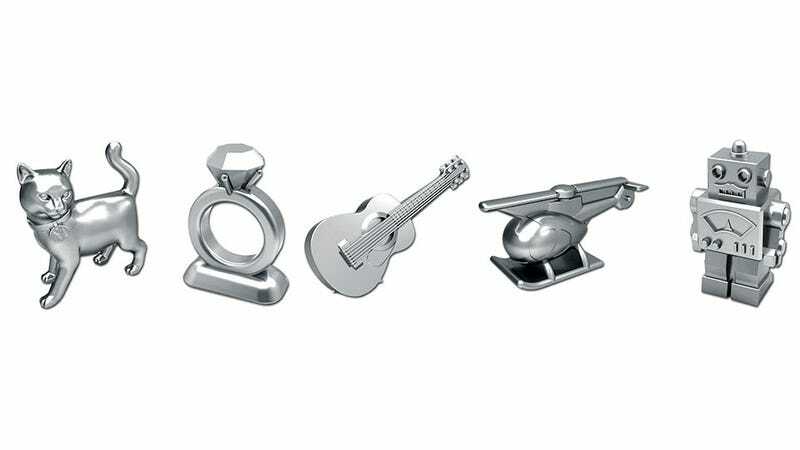 Hasbro, perhaps after a sharp blow to the head, have decided a good way to get people interested in Monopoly again is to launch a campaign where one of the game's iconic pieces is killed off. Not only are they messing with a tradition that didn't need to be messed with, they're handling it in a fairly obnoxious way by putting it to a vote. On February 5, the original piece (wheelbarrow, shoe, top hat, thimble, iron, dog, car or battleship) with the lowest votes will be gone, replaced by a... toy robot, helicopter, cat, guitar or diamond ring. (Though, OK, the robot is pretty great, since you can pretend you're in a Japanese monster movie. Take THAT, Pall Mall. Rargh).